A wake up call? Ethiopian State Television ETV reported that the hundreds of soldiers that marched to the State Palace to demand a pay rise and reform within the military have reached a tentative agreement with the Prime Minister. 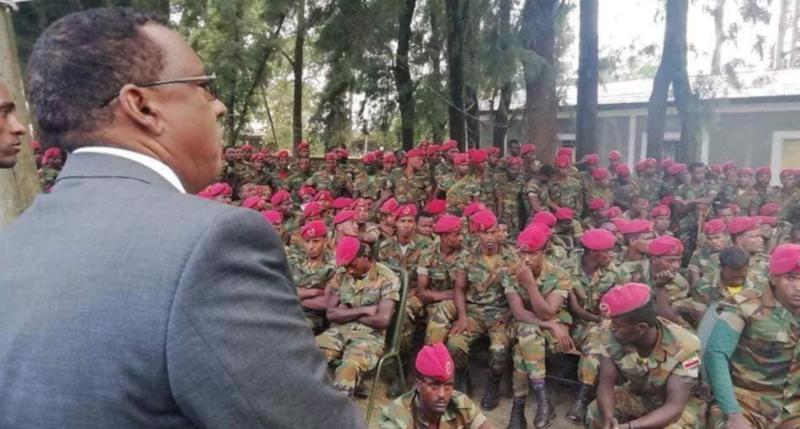 Ethiopian State Television ETV reported that the hundreds of soldiers that marched to the State Palace in Addis Ababa today to demand a pay rise and reform within the military, have reached a tentative agreement with Prime Minister Abiy Ahmed. In addition to asking for pay rises, the soldiers asked PM Abiy to “review the structure and operations of the military”, ETV said [see the video below]. The unexpected and unannounced show by these soldiers at the office of the Prime Minister led to a momentary panic in Addis Ababa that led to the shutting down of the Internet for nearly three hours. According to the Federal Police Commissioner, Zeinu Jamal, the soldiers first demanded that they enter the premises of the Palace armed with their weapons. There was boost up of security at and near the Palace out of an abundance of caution. However, they were let in and meet Deputy Prime Minister Demeke Mekonnen after they had been disarmed. A Facebook post made by the Deputy Prime Minister states that, the soldiers have discussed on wide range of issues with him, and promised that a nationwide reform would be implemented within the national defense force. Later, the soldiers also met and discussed with the Prime Minister. But PM Abiy has jokingly ordered them to do some push-ups as a form of punishment for showing up at his office without prior appointment. But he also got down to the ground and did the push-ups with the soldiers.